I had the most revealing experience recently. I think it is important enough and relevant enough that it should be shared with all of you. I am abundant in every good thing. As I quickly evaluated certain areas of my life, I honestly felt like that was true for me. I am abundant in many, many wonderful things. All of the things I view as good and great blessings to me, relationships, employment, food, safety, etc. The one area that I notice feeling a lack of abundance would be in the area of money. I know I am not alone here and it isn’t for lack of appreciation for money or a good job. Changes in the economy over the last 5 years have contributed to some of our difficulties. Unemployment, underemployment, inflated housing prices, crashing housing prices, and short-selling of our home are probably the biggest influences on our situation. I don’t blame these for my relationship to money, but they have taught me a lot about money in the process and have left us with a bit of a hole to dig out of. I feel fortunate to be able to recognize my many blessings regardless of the numbers in the family budget. Back to my original point though. 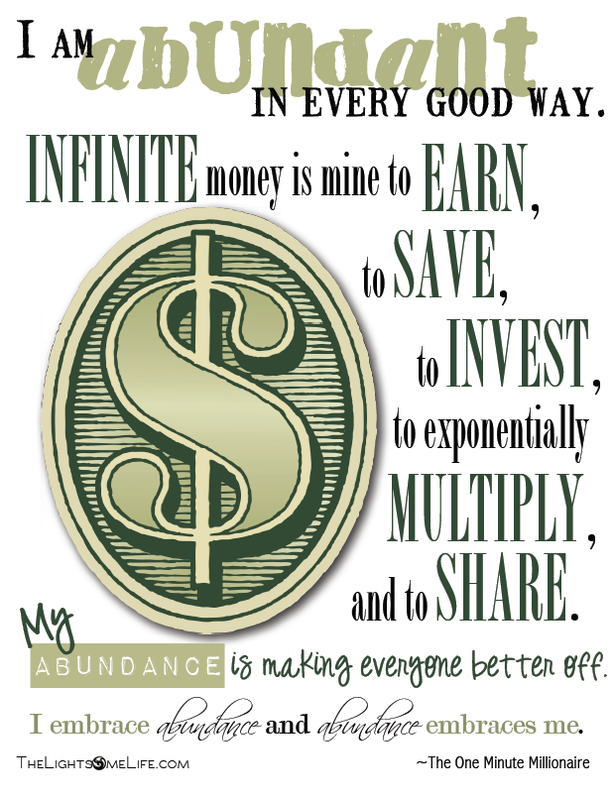 After reading the affirmation – I am abundant in every good thing, I immediately realized that I held a judgement against money in some fashion that made it not “good” to me. I muscle tested this belief for me (muscle testing is what helps me recognize beliefs I hold on a sub-conscious level). I held strong on the belief that “I am abundant in every good thing” but tested weak on the statement “money is good.” How sad for me to realize that I was holding myself to this belief and with all my good intentions surrounding money it doesn’t flow in my life and I am not abundant in it because I don’t belief it is GOOD. What WAS money then? What did I believe it to be for me? Money in and of itself is nothing. It is energy and a resource that we exchange in paper/coin form for goods and services. Money becomes SOMETHING when we connect it to values and beliefs. My desire was to discover what I sub-consciously believed money to represent for me and if there was something to clear in regards to that, I needed to take care of it. I started to think of any and every possible meaning I could have placed upon money. I was shocked when I finally connected what money represented for me. 2 things. For me, money was CONTROL and PAIN. A certain memory of my childhood had been coming to my mind over and over again. I am in my parents bathroom as a child of 6 or 7. My parents at this time have 7 of the 11 total kids in my family and as a way to teach us the value of money and to encourage us to get our chores done, they would pay us each a quarter for doing our jobs. The money was kept in small quart jars in their bathroom. I remember looking at my jar and feeling detached from what I wanted. I knew money was important, but it was always out of my control. Someone would give it to me for my efforts and then it was put in a jar and I simply would look at it but never remember being instructed in how to use my money besides learning the importance of paying tithing. I really wanted it though. I wanted to play with it and use it! I have no need to blame my parents for wanting to teach me about money and how to earn it. I was a hard worker and did learn how to earn it. But, I also took away from the experience a perception and belief surrounding money, that it was something out of my personal control and was controlled by others on my behalf. That I really didn’t have control when it comes to how to increase my earnings or even how to spend it. As a kid, all I wanted to do with money (mine or what I swiped from my dad’s dresser – but that is another story) was to spend it on candy at the local 7-11 on my way home from school. I am sure there are other beliefs I picked up around money, but for me to clear my biggest blocks, it was important for me to recognize that I viewed money as CONTROL. My second belief about money was that it was PAIN. This has some relevance to my life particularly surrounding the my birth experience and ages 18 & 32, but more than anything, I felt this was a generational belief that I had inherited. The circumstances surrounding my family over 100 years ago seems to have created a belief that money is pain. WHY? Most likely because of the strife it caused in personal relationships and other core values of the family unit. It became better to live a life without an abundance of money or even better to distance myself from money by creating debt, to keep myself as far away from pain as I could. I love my form of energy clearing and balancing, because it is so simple to acknowledge and clear these limiting beliefs that are no longer serving me. After clearing away these beliefs surrounding money, I tested myself on the affirmation – “Money is good” and FINALLY, I now hold that to be true for me. What has become even more exciting is to feel a great relief and burden lifted. I have had more energy, focus and opportunities arise since clearing these false beliefs from my mindset and overall energy. If you would like my assistance in helping you shift your mindset and clear away negative belief patterns, I invite you to look into one-on-one coaching sessions with me.